For Sara, 16 and pregnant, it feels as if her life is over. Her boyfriend seems to have disappeared, and her only option left is to have her baby adopted. She chooses George and Eva. But after the birth, when Sara can't let go, the couple make a drastic decision with far-reaching consequences for all of them. 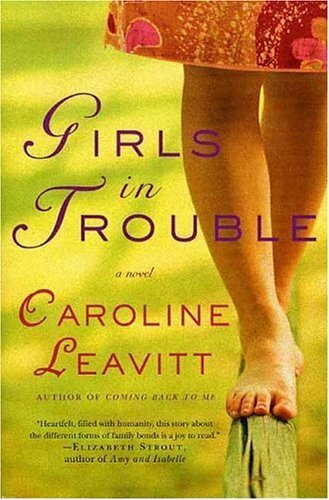 Caroline Leavitt has written several books including Girls in Trouble, Coming Back to Me, Living Other Lives, Family, Jealousies, Lifelines and Pictures of You. She won First Prize in Redbook Magazine's Young Writers Contest for her short story, Meeting Rozzy Halfway, which grew into the novel and the 1990 New York Foundation of the Arts Award for Fiction for Into Thin Air. Her essays, stories, and articles have appeared in numerous publications including New York magazine, Psychology Today, Parenting, The San Francisco Chronicle, The Chicago Tribune, and The Washington Post. She is a book critic for The Boston Globe and People and a writing instructor at UCLA online.